1 The Geophysical Institute Magnetometer Array: Making Real-Time Geophysical Measurements Available for Operational Space Weather Needs J Galbraith, M Heavner, D WilkinsonGeophysical Institute, University of Alaska, matt.heavner@uas.alaska.edu, http://magnet.gi.alaska.edu/ ACKNOWLEDGEMENTS The GIMA array has been supported by John Olson, Roger Smith, and Hans Nielsen of the Geophysical Institute. GIMA operations have been supported by Ruth Freeburg, Kay Lawson, and Brian Lawson. Financial support has been provided by the National Science Foundation, the Geophysical Institute, and the University of Alaska Southeast. The PURAES magnetometer are operated by Arctic and Antarctic Research Institute (AARI), St. Petersburg, Russia, and data from these stations have been made available through a team effort with participants from the following organizations: World Data Center for Geomagnetism, Kyoto University (WDC Kyoto); National Institute of Information and Communications Technology (NICT), Japan; Institute for Dynamics of Geospheres (IDG), Russian Academy of Science; AARI, Russia; Geophysical Institute (GI), University of Alaska; Johns Hopkins University Applied Physics Laboratory (JHU/APL), USA. ABSTRACT Fall AGU 2008 SA51A-1546 INSTRUMENTS The Narod ring-core magnetometer used by the Geophysical Institute (GI) is manufactured by Narod Geophysics Ltd. of Canada. The magnetometer is a fluxgate design using a triaxial set of cores. The sensor cores are shown here in the GI enclosure. A carefully machined ceramic block (the white block in the center) holds each of the three cores in mutually orthogonal directions. The cores are wrapped in copper wire. The ceramic block is mounted to the base of an aluminum enclosure designed and manufactured at the GI. The blue-anodized aluminum cover encloses and seals the sensor block from the elements. The gold-anodized aluminum housing is mounted on a platform which can be leveled and oriented to any azimuth. The red cable attaches the sensors to the preamplifier (the black box on the table). The characteristics of the Narod system are: Temperature stability: <0.1nT/degree (sensor) Long term drift: $< 10$ pT/day Noise: 7 pT/Hz^(1/2) @ 1Hz Orthogonality error: <0.1 degree Digitization: 16 bits The magnetometer electronics are controlled by an S-100 computer that uses internal calibrations to produce digital output in units of nano Tesla. The nominal data rate is 8 samples per second. The unit is also capable of digitizing other signals and including them in the output data stream. We use this function to include an IRIG D slow-code time signal that is generated by a GPS clock in one data channel for absolute timing. 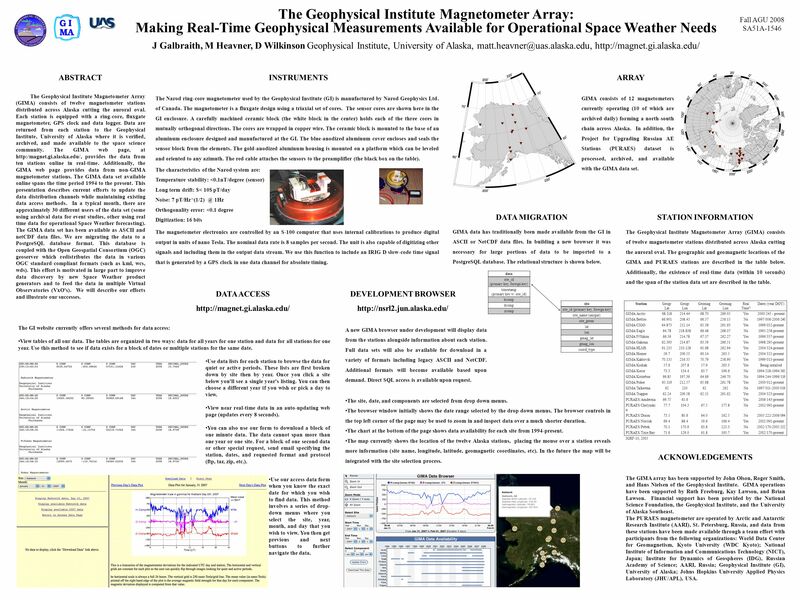 ARRAY STATION INFORMATION The Geophysical Institute Magnetometer Array (GIMA) consists of twelve magnetometer stations distributed across Alaska cutting the auroral oval. The geographic and geomagnetic locations of the GIMA and PURAES stations are described in the table below. Additionally, the existence of real-time data (within 10 seconds) and the span of the station data set are described in the table. GIMA consists of 12 magnetometers currently operating (10 of which are archived daily) forming a north-south chain across Alaska. In addition, the Project for Upgrading Russian AE Stations (PURAES) dataset is processed, archived, and available with the GIMA data set. StationGeogr Lat Geogr Lon Geomag Lat Geomag Lon Real Time? Dates (year/DOY) GIMA/Arctic68.118214.4468.70269.05Yes2000/245 - present GIMA/Bettles66.901208.4566.57256.15No1997/006-2006/240 GIMA/CIGO64.873212.1465.38261.63Yes1999/032-present GIMA/Eagle64.78218.83866.48268.07No1995/258-present GIMA/FtYukon66.56214.7867.37262.27Yes1996/337-present GIMA/Gakona62.393214.8763.59266.51Yes1998/295-present GIMA/HLMS61.235210.12861.68262.94Yes2004/324-present GIMA/Homer59.7209.5360.14263.5Yes2004/325-present GIMA/Kaktovik70.135216.3570.79258.90Yes1999/013-present GIMA/Kodiak57.6207.857.9263.3YesBeing installed GIMA/Koror73.3134.463.7196.6No1994/218-1994/365 GIMA/Kotzebue66.85197.3964.66246.70No1994/244-1996/119 GIMA/Poker65.119212.5765.68261.78Yes2000/012-present GIMA/Talkeetna6221062262No1997/011-2000/019 GIMA/Trapper62.24209.5862.51261.62Yes2004/323-present PURAES/Amderma69.7561.6Yes2006/143-present PURAES/Chelynski n 77.7104.367.5177.8No2002/091-present PURAES/Dixon73.580.664.0162.5No2005/222-2006/094 PURAES/Norilsk69.488.459.6166.4Yes2002/091-present PURAES/Pebek70.1170.963.8223.3No2002/170-2005/252 PURAES/Tixie Bay71.6129.061.8193.7Yes2002/170-present IGRF-10, 2005 The Geophysical Institute Magnetometer Array (GIMA) consists of twelve magnetometer stations distributed across Alaska cutting the auroral oval. Each station is equipped with a ring-core, uxgate magnetometer, GPS clock and data logger. Data are returned from each station to the Geophysical Institute, University of Alaska where it is veried, archived, and made available to the space science community. The GIMA web page, at http:/magnet.gi.alaska.edu/, provides the data from ten stations online in real-time. Additionally, the GIMA web page provides data from non-GIMA magnetometer stations. The GIMA data set available online spans the time period 1994 to the present. This presentation describes current efforts to update the data distribution channels while maintaining existing data access methods. In a typical month, there are approximately 30 different users of the data set (some using archival data for event studies, other using real time data for operational Space Weather forecasting). The GIMA data set has been available as ASCII and netCDF data files. We are migrating the data to a PostgreSQL database format. This database is coupled with the Open Geospatial Consortium (OGC) geoserver which redistributes the data in various OGC standard-compliant formats (such as kml, wcs, wds). This effort is motivated in large part to improve data discovery by new Space Weather product generators and to feed the data in multiple Virtual Observatories (VxO's). We will describe our efforts and illustrate our successes. DEVELOPMENT BROWSER http://nsrl2.jun.alaska.edu/ The GI website currently offers several methods for data access: View tables of all our data. The tables are organized in two ways: data for all years for one station and data for all stations for one year. Use this method to see if data exists for a block of dates or multiple stations for the same date. DATA ACCESS http://magnet.gi.alaska.edu/ The site, date, and components are selected from drop down menus. The browser window initially shows the date range selected by the drop down menus. The browser controls in the top left corner of the page may be used to zoom in and inspect data over a much shorter duration. The chart at the bottom of the page shows data availability for each site from 1994-present. The map currently shows the location of the twelve Alaska stations, placing the mouse over a station reveals more information (site name, longitude, latitude, geomagnetic coordinates, etc). In the future the map will be integrated with the site selection process. DATA MIGRATION GIMA data has traditionally been made available from the GI in ASCII or NetCDF data files. In building a new browser it was necessary for large portions of data to be imported to a PostgreSQL database. The relational structure is shown below. data site_id (primary key, foreign key) timestamp (primary key w/ site_id) hcomp dcomp zcomp site site_id (primary key, foreign key) site_name (unique) site_geom lat lon gmag_lat gmag_lon coord_type Use data lists for each station to browse the data for quiet or active periods. These lists are first broken down by site then by year. Once you click a site below you'll see a single year's listing. You can then choose a different year if you wish or pick a day to view. View near real-time data in an auto-updating web page (updates every 8 seconds). You can also use our form to download a block of one minute data. The data cannot span more than one year or one site. For a block of one second data or other special request, send email specifying the station, dates, and requested format and protocol (ftp, tar, zip, etc.). Use our access data form when you know the exact date for which you wish to find data. This method involves a series of drop- down menus where you select the site, year, month, and day that you wish to view. You then get previous and next buttons to further navigate the data. A new GIMA browser under development will display data from the stations alongside information about each station. Full data sets will also be available for download in a variety of formats including legacy ASCII and NetCDF. Additional formats will become available based upon demand. Direct SQL access is available upon request. Download ppt "The Geophysical Institute Magnetometer Array: Making Real-Time Geophysical Measurements Available for Operational Space Weather Needs J Galbraith, M Heavner,"
What is the United Way 1 Network of more than 1,300 locally run organizations Work to empower individuals and communities across the country. Building a Weather Station for a Near-Space Payload AEM 1905: Spaceflight with Ballooning University of Minnesota. The IRIS-Bus Concept for Seismic Instrumentation John D. West Arizona State University. HFA Weigh Scales Portable Weigh Scales Aluminum Frame Construction Stainless wash-down enclosure Counts parts and/or weigh in units of Grams, Kilograms. SMART BOX. Connectors Evolved From 4-Pin to the SAE J560 7-Pin. Voyager Spaceprobe1:48 scale Read all the instructions and review the parts sheets before starting. Note the red stars for aligning the HGA dish, support. Building a Pressure/Temperature Weather Station (Sensor Pack) AEM 1905, Fall 2008. Paul T.M. Loto’aniu 1,2 and H.J. Singer 1 NOAA Space Environment Center 1 CIRES, University of Colorado 2 Paul T.M. Loto’aniu 1,2 and H.J. Singer 1 NOAA. TRAMEC SMART BOX. Connectors Evolved From 4-Pin to the SAE J560 7-Pin Connectors Evolved From 4-Pin to the SAE J560 7-Pin. Corporate Presentation Introduction OurPCB Tech Limited was found in 2005, it provides professional PCB&PCBA service for over than 1500 customers around. Coronal Ejecta in October - November of 2003 and predictions of the associated geomagnetic events 1 Big Bear Solar Observatory, New Jersey Institute of. Colorado Space Grant Consortium Gateway To Space ASEN / ASTR 2500 Class #06 Gateway To Space ASEN / ASTR 2500 Class #06. An Automatic Instrument to Measure the Absolute Components of the Earth's Magnetic Field H.-U. Auster, M. Mandea, A. Hemshorn, E. Pulz, M. Korte. SMART About NASA’s Magnetospheric Multiscale Mission (MMS) MAGNETIC RECONNECTION is a little-understood physical process at the heart of space weather. Comparing NDVI and observed stem growth and wood density in forests of northern Eurasia MK Hughes 1, AG Bunn 2, AV Kirdyanov 6, V Shishov 7, MV Losleben. International Arctic Buoy Programme (IABP)  Established by PSC in 1979  20 Participants from 9 countries.  33 buoys currently reporting  Data are available. Tutorial 1 Description of a Weather Station using SensorML Alexandre Robin - 2006.